NEWCASTLE United’s Gael Bigirimana won’t kick a ball for loan club Rangers – and Shane Ferguson is unlikely to play any part this season. 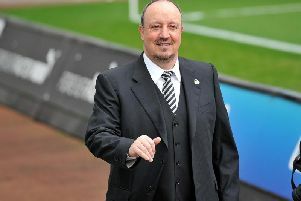 Newcastle loaned five players to Rangers, in which owner Mike Ashley holds a stake, in early February – but only Haris Vuckic and Remie Streete have played for the club. Forward Vuckic has featured regularly, but defender Streete suffered an injury on his debut. Winger Ferguson and defender Kevin Mbabu have been sidelined with injuries, while midfielder Bigirimana has a “medical condition”, and won’t play this season. Rangers are paying a proportion of their wages during their time at Ibrox. Manager Stuart McCall said: “Obviously, Vuckic has been in the side and has done well. He is a good, a talented player. “Streete came and played the first game and pulled his hamstring. He was put in straight away and he wasn’t ready to play a high-tempo game, because he had no football behind him. “He was out for a couple of weeks then came back and pulled his thigh, and he’s had an ear infection on top of that. “So he’s two or three weeks again, and (he is) working with the medical side of it. “But I don’t think Remie has played lots of football over the past two years. “Kevin Mbabu is training with us, and he has played two Under-20 games, but he’s not played a lot of football in the last two years. “I don’t think and his match fitness is up to what we would like at the moment. “Young Bigi is a smashing lad, you seem him with a smile on his face all around the place. He has a medical condition that our consultant is dealing with, but he won’t play for us this season. “And Shane Ferguson has had a long-standing serious knee injury, I think he’s been out for four or five months. “He had a minor setback a couple of weeks ago, because he was supposed to be up with us, so he won’t be up with us for another couple of weeks. “By then he will have been out for five or six months with a knee injury, so he’ll likely need another six weeks to get him anywhere near being available.